We have all had our thinking caps on in the office this week, trying to come up with some new and different ideas for treats to go on our sweetie tables. With so much inspiration from our American neighbours we have managed to suggest a number of delicious treats to our fantastic supplier utterly charming cakes and are all very much looking forward to trying them out next week! I am going to give you a sneak preview of a couple of our ideas in this blog post, and if you have any further suggestions yourself i would love to hear from you! 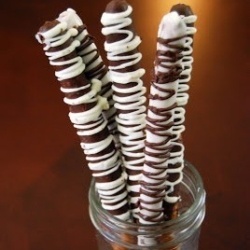 Clever cake pops on wafer cones. Not only do they look delicious, but they look exactly like the real thing! Would be perfect for an ice cream party or a 50’s diner party. 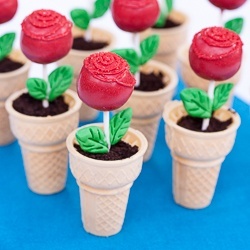 Cake pops in cones again, such a lovely but simple idea, perfect for an alice in wonderland party! Very, very pretty. On top of the cake or propped up in vases these chocolate numbers would look lovely on your sweetie table and would add a little something extra to your party- especially a carnival party when decorated in this specific way. Whoopie pies! Made up of two round mound-shaped chocolate sponges with a cream or frosting filling sandwiched in between. Slightly bigger in size than a macaroon, these pies look beautiful on any table and are simply delicious! Very excited to try all of these out in the office next week, going to be a fun day!